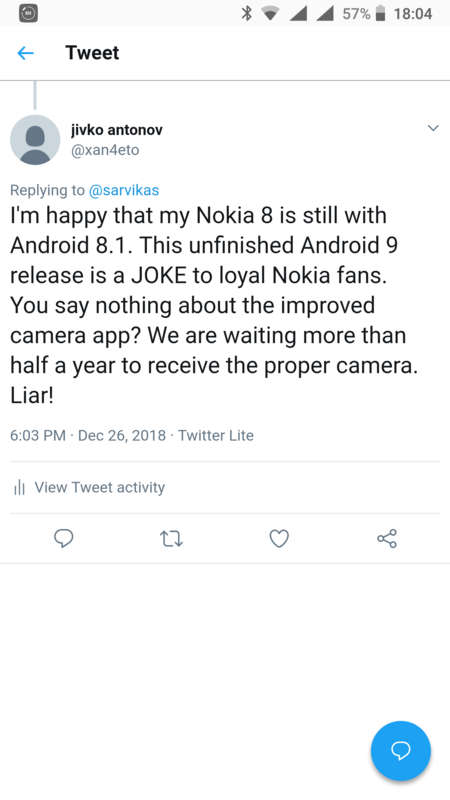 We are tired of making statements and complaining about Nokia 8 updates and listening of Juho's lies, moderators will be having eye on what we post, lets see when do we get reply from them for not giving camera update in pie, and why not nokia 8 is not an android one device, they themselves announced that all our phone line-up from Nokia 3 are android one devices, everyone who sees this message do comment "DOWN DOWN JUHO"
I'd appreciate if you guys put forward your opinions without using harsh or vulgar language. 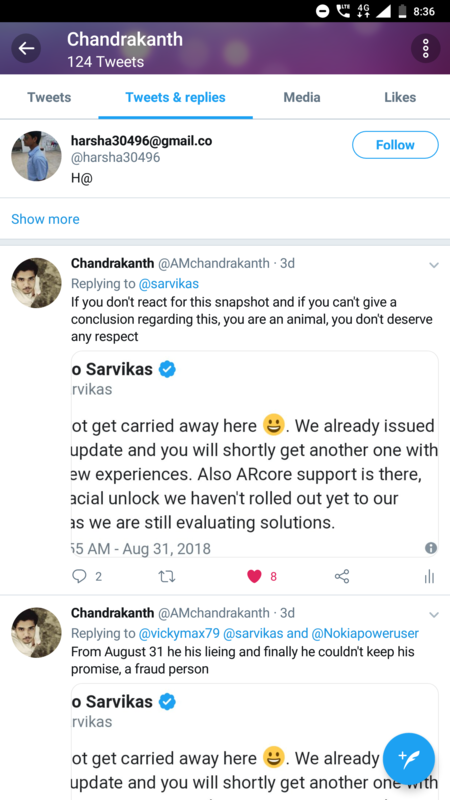 As about Sarvikas, whether you like him or not, he's the only one who at least communicates with us. Would you want him to shut up and be like other HMD employees who don't even interact? Will that help in any way? What I can add here is that software development is a continued effort. You cannot drop a deadline regarding when you will complete the project 100%. There can be bugs, issues, roadblocks and what not. Hence, we can always only estimate when a software will be ready, but never have a rigid deadline. There can be delays. Your concern about the camera update are legitimate. And I support it too. However, please keep a nicer tone so that it is fit for the community. 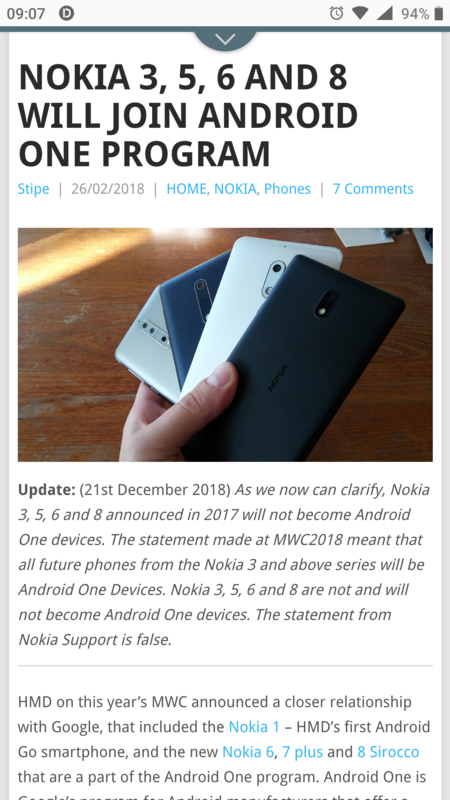 Nokia 8 is not an Android One device. Android One devices are specially certified by Google. Nokia phones without the Android One certification also run on stock Android, but there are technical differences between the two. And I'm sure you cannot just update the phone to Android One. Google offers different licenses and the license for Nokia 8 is already in place. So, unfortunately, I don't see any means by which it will convert itself into Android One. There is no comma after "Guys" and no space after "it." "is" is flipped and there is no dash after "liar." @singhnsk Totally agree with your comment supra. All well, but then prioritizing newer models/devices and pushing others aside is not acceptable in my opinion. Then don't say November a device will be updated, in this case the 8 and Sirocco, and then push/prioritize the 7.1 et al. before those two devices. Then what a bonus paterfamilias would/should have done is to place and postpone the new devices, like the 7.1, after the 8 and Sirocco, don't you agree? You don't let your current clients, whom even may be recurring clients, wait in line and give your new ones priority. That's not good business practice if you do. You might gain in the short while, while loosing in the long run. Just my opinion. To me Nokia support also said that the Nokia 8 (2017) doesn't have Android one. 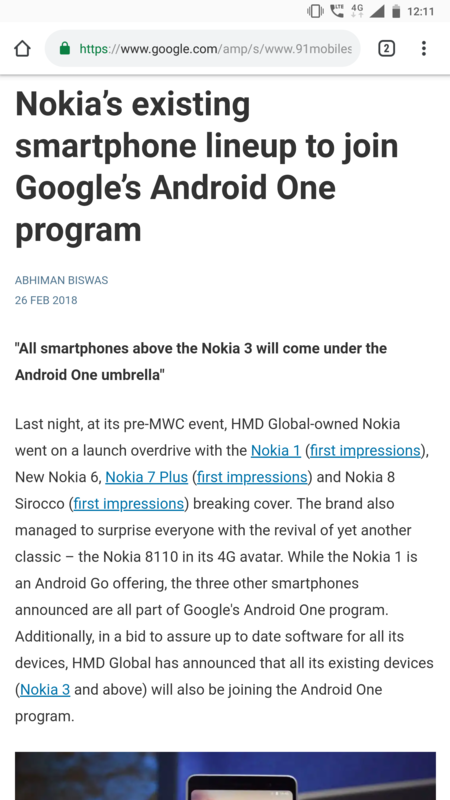 At first he tought i was mentioning Nokia 8 sirocco but after 3 times saying i was talking about the Nokia 8 (2017) he finally said that the Nokia 8 isn't but sirocco is in the Android one program. I agree, BUT this is what someone needs to tell Mr. Sarvikas. He's the one announcing deadlines (November 2018, new camera experiences with Android Pie, just a couple of more days, starting today etc.) and continuously breaking them without any explanation. Meanwhile, new mid-range phones are getting their system updates on time, and now they also have better camera software/firmware than Nokia 8! Only logical conclusion one can draw from this is that HMD is not keen on providing quality support for their flagship phones because they are sold in smaller quantity than mid-range line-up. So they channel most of their resources in updating software for new mid-range phones and only give empty promises to owners of Nokia 8 & Sirocco. Nokia 8 is a fantastic phone with only one major exception - its camera. Key to better Nokia 8 camera performance, especially in low light, is updating camera software and firmware with proper algorithms. If HMD rolls out new camera app with just changed UI and google lens feature, that will change nothing for us and we will stay stuck with lousy camera app and will be forced to continuously try out new gcam ports. That's not what owners of flagship phone are supposed to do. It starts to **** me off. My hopes are already lost. We will never receive a proper camera app. I agree. I'd like to add a few things. 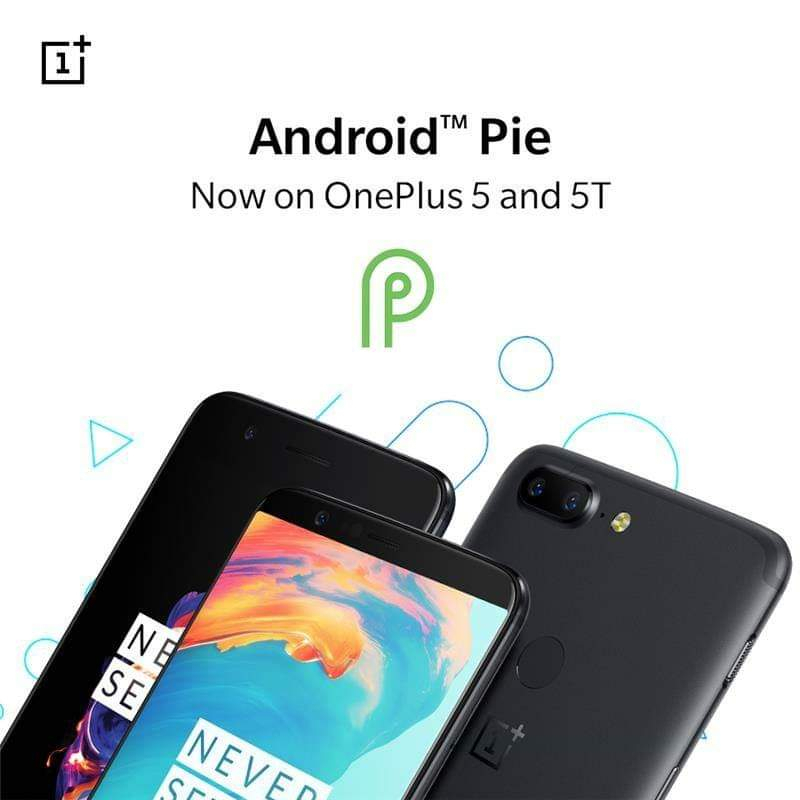 First that when the Nokia 7.1 was announced, Sarvikas mentioned on the stage that the Android Pie for Nokia 7.1 is almost ready and his own personal unit was already running an internal build of Android Pie. Plus, when a new device is announced, it is expected by the users that it should be running the latest versions of the OS. You will also notice that it is the same across OEMs. 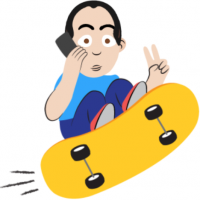 New products are prioritized over existing. I would also like to add that there is a technical difference which is greatly responsible for the updates. The Nokia 6.1, 6.1 plus, 7, 7.1 and 7 Plus share the same kernet code. The software for all of these can be developed with minor changes. If you check the build.prop from those phones, then you'll notice repeat mentions of SDM660, even though they run on lower SOCs. For example, my Nokia 7 (not plus) shows ro.product.name=gsi_sdm660_64_00CN. Then, the boot images from these phones are compatible with each other. For example, you can boot the image from Nokia 7 on a Nokia 6.1. This is the major reason why this bundle of phones got updates with a minor time gap. I do understand that all above doesn't make much of a difference to an end user. A Nokia 8 user has paid more for the device as compared to somebody with a Nokia 6. Then they should make achievable promises. For example, the Pie update for Sirocco is completely delayed by a full month. December has almost ended when the promise was for November. Google has backed two year software update from Android One platform. Although I'm not at all satisfied with the current camera app, I pity the owners of Sirocco... I guess only concentrated lawsuits would shed some hope to get their phones updated as promised in the advertisements, if HMD decides to truly forget about them.